Although these blind snakes (or Typhlopidae) live underground, they show only limited specializations for burrowing. 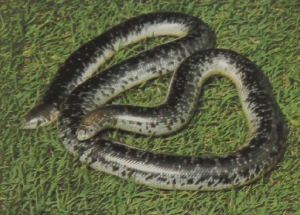 They differ from the Slender Blind Snakes (or Leptotyphlopidae) by having teeth only on the upper jaws and also by a more irregular series of connecting muscles between skin and backbone. The Giant Blind Snake of Africa, which grows to be almost 3 feet long, has the upper surface of the head rounded but the bottom flattened. The sharp, U-shaped edge so formed is used to pierce the wall between galleries of termite nests. The trunk is rounded, but the animal’s middle is much stouter than the ends, suggesting that widening of underground tunnels does not cost them too much energy: perhaps they prefer softer soils or existing tunnel systems. This species and its relatives range over much of Africa, while other blind snakes are found all around the world. Indeed one small blind snake has become so well established in agricultural areas of southeast Asia that it is regularly transported to oceanic islands and has now reached Hawaii, apparently from the Philippines.